BP p.l.c., previously known as British Petroleum, is the third largest global energy company, a multinational oil company ("oil major") with headquarters in London. The company is among the largest private sector energy corporations in the world, and one of the six "supermajors" (vertically integrated private sector oil exploration, natural gas, and petroleum product marketing companies). The Company is listed on the London Stock Exchange and is a constituent of the FTSE 100 Index. In 2007, BP’s revenues were over $291 billion, and it employed 97,600 workers in 100 countries and maintained a network of 24,100 gas stations. BP and its subsidiaries are also engaged in the manufacture of chemicals, plastics, synthetic fibers, and animal-feed products. BP began as the Anglo-Persian Oil Company, Ltd., registered in 1909 to extract and refine oil from an oil-field concession in Iran. In 1914, the British government purchased a majority share in the company, and World War I soon established the importance of a reliable national oil supply. By 1938, Anglo-Iranian’s refinery at Abadan was the largest in the world. Following World War II, the refinery was temporarily shut down when the Iranian parliament voted to nationalize the oil fields in 1951, and re-opened under an international consortium in 1953. The company name was changed to The British Petroleum Company in 1954. During the 1970s, political changes in the Middle East forced major adjustments in the oil industry, and the British Petroleum Company began to develop its oil reserves in Alaska and the North Sea. In the 1990s, acknowledging the threat of global warming, the company began a campaign to develop its image as an environmentally responsible corporation, changed its name to BP, and increased its investment in alternative sources of energy. In 1998, it merged with Amoco (formerly Standard Oil of Indiana) and in 2000, acquired Arco (Atlantic Richfield Company) and Burmah Castrol to become one of the largest oil companies in the world. In the oil industry it has demonstrated the viability of cutting emissions and reducing its impact on the environment. BP has been involved in a number of political and environmental controversies. Several accidents and spills associated with its production of oil in Prudhoe Bay, Alaska, have justified concerns that drilling for oil in the Alaskan wilderness will cause damage to the environment. In 1900, Sir Henry Drummond Wolff, a former British minister to Teheran, approached William Knox D'Arcy, a wealthy owner of mining interests in Australia, to invest in Persian oil exploration. In May 1901, D'Arcy was granted a concession by the Shah of Iran to search for oil over 480,000 sq. miles (1,243,195 km²) in Iran. D'Arcy agreed to finance the search, and sent George Reynolds and a team of explorers to Shardin, Iran. By 1905 he had invested his entire fortune and there were still no signs of oil. In May 1905, the British-owned Burmah Oil Company took over the rights to his concession in return for 170,000 Burmah Oil shares and a payment to cover expenses D’Arcy had incurred. Oil was discovered on May 26, 1908, the first commercially significant find in the Middle East. On April 14, 1909, the Anglo-Persian Oil Company (APOC) was incorporated to exploit the new oil field. On the day Anglo-Persian stock opened for trading in London and Glasgow, investors waited five deep in front of the cashiers at a Scottish bank to buy shares in the new company. The Field of Naphtha oilfield was 210 kilometers from Abadan, at the mouth of the Persian Gulf, where Anglo-Persian was building an oil refinery. It took two years to build a pipeline across the rugged mountains. Segments of pipe imported from the United States were carried upriver by barge, then dragged by mules and finally by laborers where the land was too steep for animals to pass. At its completion, the Abadan refinery was the world’s largest, supported by a workforce of fitters, riveters, masons and clerks from India, carpenters from China and semi-skilled workers from the surrounding Arab countries. By 1914, the Anglo-Persian project was nearly bankrupt; it could not find a market for its oil. Automobiles were too expensive to be widely used, and more established companies in Europe and the United States had cornered the market in industrial oils. The Persian oil’s strong, sulfurous stench made it unsuitable as kerosene for home heating, one of the primary uses for oil at the time. Anglo-Persian executives had repeatedly approached the British Royal Navy as a prospective customer for its oil, but conservative politicians were reluctant to endorse the use of oil instead of coal for fuel. Winston Churchill, then First Lord of the Admiralty, thought Britain needed a dedicated oil supply, and he argued the case in Parliament, urging his colleagues to “look out upon the wide expanse of the oil regions of the world!” Only the British-owned Anglo-Persian Oil Company, he said, could protect British interests. Parliament passed the resolution with an overwhelming majority, and the British government became a major shareholder in the company. World War I began just two weeks later, establishing the importance of a reliable supply of oil for military dominance. The British Petroleum brand had originally been created by a German oil company as a way of marketing its products in Britain. During World War I, the British government seized the German company’s assets, and sold them to Anglo-Persian in 1917. Anglo-Persian gained an instant distribution network in the UK, including 520 depots, 535 railway tank wagons, 1,102 road vehicles, four barges and 650 horses. As the war was ending, the Royal Navy complained that Anglo-Persian oil was causing engine problems in colder climates. Anglo-Persian bought an eighteenth century mansion at Sunbury-on-Thames, near London, and set up a scientific research laboratory in the basement. During the two decades following World War I, gas and electricity largely replaced kerosene for home heating, and gasoline-fueled delivery vehicles began to compete with railways in transporting freight. Mass-produced cars flooded out of factories in Europe and the United States. Gasoline pumps bearing the BP label appeared around Britain, often flying little Union Jacks as a patriotic flourish. There were 69 pumps in Britain in 1921, and over 6,000 by 1925. The “BP” letters also became a familiar sight on the continent, as Anglo-Persian entered the European market. In 1935, Persia changed its name to Iran, and Anglo-Persian Oil Company became the Anglo-Iranian Oil Company (AIOC). When Britain entered World War II in 1939, gasoline was rationed and BP, Shell and the other brands on sale in the UK were consolidated into a generic fuel labeled "Pool." BP’s activities on the continent stopped abruptly. Anglo-Iranian employees became involved in innovative schemes, such as burning petrol at British airstrips to clear fog for take-offs and landings and helping to engineer the giant, spooled gasoline pipeline that trailed Allied ships on their way to Normandy. Anglo-Iranian had recently found a way to improve the efficiency of aviation fuel. The quantity of fuel needed by the British Air Force could only be made by refitting the Abadan refinery in Iran, but the three ships carrying supplies for the refit were sunk. During the war, 44 of the company’s tankers were sunk, killing 657 crew members; another 260 were taken prisoners of war. The British government asked Anglo-Iranian to find more oil on British soil, and production at a field in Nottingham, England was increased. As Europe rebuilt after World War II, Anglo-Iranian invested in refineries in France, Germany, and Italy and initiated new marketing efforts in Switzerland, Greece,Scandinavia, and the Netherlands. BP gasoline went on sale for the first time in New Zealand. In the Middle East, nationalists questioned Western companies’ right to profit from Middle Eastern resources. AIOC and the government of Iran initially resisted nationalist pressure to revise AIOC's concession terms still further in Iran's favor. In March 1951, the pro-western Prime Minister of Iran, Ali Razmara, was assassinated. The Majlis of Iran (parliament) elected a nationalist, Dr. Mohammed Mossadeq, as prime minister. In April, the Majlis voted unanimously to nationalize the oil industry. The British government contested the nationalization at the International Court of Justice at The Hague, but its complaint was dismissed. All political debate exhausted, Anglo-Iranian’s expatriate employees left Iran and the refinery was shut down. The British Royal Navy imposed a blockade around the country in order to force the Iranian regime to abandon the effort to nationalize its nation's oil. Governments around the world boycotted Iranian oil. The boycotts, coupled with the inexperience of Iranian crews, greatly reduced the output of the oilfields in Iran. Within 18 months, the Iranian economy was in ruins. On August 19, 1953, a coup by the Iranian military and royalists loyal to the Shah, backed by the British and United States governments, removed Mossadeq from office. He was replaced by pro-Western general Fazlollah Zahedi. The Shah, who had left the country briefly to await the outcome of the coup, returned to Iran. He abolished the democratic Constitution and assumed autocratic powers. An international consortium, National Iranian Oil Company was created to run the oil operations in Iran, with Anglo-Iranian Oil Company holding 40 percent of the shares, five major American companies including Standard Oil of Indiana (Amoco) holding another 40 percent, and Royal Dutch Shell and Compagnie Française des Pétroles, now Total S.A. holding 20 percent. The consortium agreed to share 50 percent of the profits with Iran, but not to allow interference in its business affairs. In 1954, the board changed the company’s name to The British Petroleum Company. BP continued to operate in Iran until the Islamic Revolution in 1979. The new regime of Ayatollah Khomeini confiscated all of BP's assets in Iran without compensation, ending BP's 70-year presence in Iran. In 1955, British Petroleum became a holding company. In 1959, British Petroleum Company began exploration in Alaska and in 1965, it was the first company to strike oil in the North Sea. In 1970, its North Sea crews found the Forties field, which could produce 400,000 barrels of crude oil a day. In 1965, BP found natural gas in the English Channel, enough to power a medium-sized city. During the 1970s, political changes in the Middle East, which began with Muammar al-Ghaddafi’s rise to power in Libya in a military coup in 1971, forced major adjustments in the oil industry. The same year, after Britain withdrew its military presence in Iran, Iran seized some small Arab Islands near the Strait of Hormuz and Ghaddafi retaliated by nationalizing BP’s interests in Libyan oil production. Several oil-rich nations including Iran, Iraq, Saudi Arabia, Abu Dhabi, and Qatar announced their intention to nationalize their oil resources within the next 10 years. BP’s shipments of oil from the Middle East dropped from 140 million tones in 1975 to 500,000 tonnes in 1983. Over the same period, Middle Eastern oil, which had once comprised 80 percent of BP’s total production, declined to just 10 percent of its total output. British Petroleum began to concentrate on developing its production of oil in other parts of the world. Its engineers designed production platforms with legs tall enough to perch above the rough waters of the North Sea, and robust enough to withstand the harsh winters. In 1975, oil began to flow through the largest deepwater pipeline ever constructed, to a terminal at Firth of Forth. The 1,200 kilometer Trans-Alaska pipeline system was the largest civil engineering project ever attempted in North America, and one of the most carefully watched. The final designs for the pipeline included long above ground stretches so that the warm oil passing through would not melt the permafrost and raised areas at caribou crossings to ensure that migration habits wouldn’t be disturbed. BP had no refineries or gas stations in the United States to process or market the Alaska oil. In 1978, BP acquired a 25 percent stake in Standard Oil of Ohio or Sohio, a spin-off of the former Standard Oil which had been broken up after anti-trust litigation. In 1987, BP bought the company outright, incorporating it into a new company, BP America. 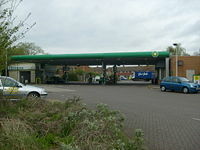 A British BP Petrol Station. 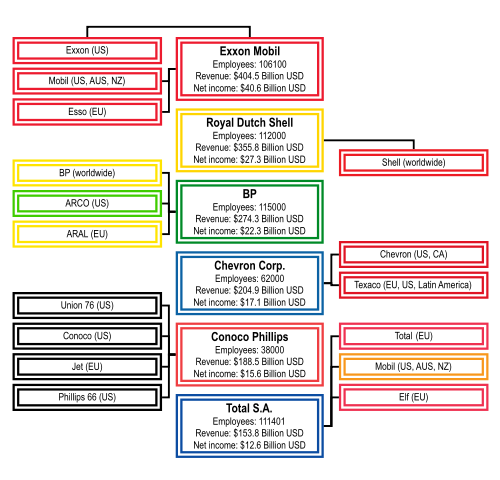 Between 1979 and 1987, the British government sold its entire holding in BP in several tranches. During the sale process, an attempt by the Kuwait Investment Office, the investment arm of the Kuwait government, to acquire control of BP was blocked by the strong opposition of the British government. In 1987, British Petroleum negotiated the acquisition of Britoil and those shares of Standard Oil of Ohio (Sohio) not already owned. British Petroleum merged with Amoco (formerly Standard Oil of Indiana) in December 1998, becoming BPAmoco until 2000, when it was renamed BP. Most Amoco gas stations in the United States have changed to the look and name of the BP brand. In many states, however, BP still sells Amoco-branded gasoline, rated the #1 petroleum brand by consumers 16 years in a row. In May 2008, the Amoco name was largely phased out in favor of "BP Gasoline with Invigorate," to promote BP's new additive. The highest grade of BP gasoline available in the United States is still called Amoco Ultimate. In 2000, British Petroleum acquired Arco (Atlantic Richfield Company) and Burmah Castrol plc. In April 2004, BP moved most of its petrochemical businesses into a separate entity called Innovene within the BP Group, intending to sell the new company as an Initial Public Offering (IPO) on the New York Stock Exchange. On October 7, 2005, BP announced the sale of Innovene to INEOS, a privately-held UK chemical company for the sum of $9 billion (£5bn). BP has recently increased its oil exploration activities in frontier areas like the former Soviet Union. In Russia, BP owns 50 percent of TNK-BP, with the other half owned by three Russian billionaires. TNK-BP accounts for a fifth of BP's global reserves, a quarter of BP's production, and nearly a tenth of its global profits. BP has been involved in the economic development of Vietnam since 1986. By the end of 2007, with partners Petrochina and Sinopec, BP had developed approximately 1,000 outlets in China. Chief Scientist of BP, Steven Koonin (top right, with laptop), speaks about the energy scene in the boardroom in 2005. Under the guidance of Lord John Browne, who became Chief Executive Officer of BP in 1995, BP began a massive campaign in 1997, to reinvent its public image as a company that is concerned about environmental issues and to prepare for a future when oil will be replaced by other sources of energy. The company shortened its name from British Petroleum to BP, coined the slogan Beyond Petroleum (The company states that BP was never meant to be an abbreviation of its tagline.) and redesigned its corporate logo. The British Petroleum shield that had been a familiar image in Britain for more than 70 years was replaced with a green, yellow and white sunburst intended to highlight the company’s interest in alternative and environmentally friendly fuels. The campaign drew a great deal of criticism from environmental groups, particularly as the company was simultaneously expanding through mergers and acquisitions to become the second-largest oil company in the world. In spite of the criticism, BP has led other oil companies in confronting the issue of global warming, seeking to reduce carbon emissions, and attempting to reduce the impact of its operations on the environment. In 1996, BP/Amoco withdrew from the Global Climate Coalition, an industry organization established to promote skepticism about global warming, and offered its support to the Kyoto Protocol. In 1998, Browne publicly committed BP to cutting its carbon dioxide emissions by 10 percent below 1990 levels by the year 2010. To meet this target, BP set up a system in which each of its 150 business units, spread across more than 100 countries, was assigned a quota of emissions permits and encouraged to trade with one another. Each business unit could bring itself into compliance by cutting its own emissions or buying emissions credits from other units. If a unit made enough greenhouse-gas reductions to have leftover permits that could be sold to other business units, those savings were reflected in pay scales and bonuses at year's end. The target was reached within two years with no net economic cost to the company, actively demonstrating that regulating carbon dioxide emissions according to the Kyoto Protocol was economically viable. In 2005, BP was considering testing carbon sequestration in one of its North Sea oil fields, by capturing carbon dioxide from the natural gas burned at power plants in the UK and pumping it into depleted underground oil reservoirs, where it would have the added benefit of helping to force out the pockets of oil remaining underground. Carbon capture and burial, a process invented in 1980, is regarded by the United Nations and Inter-government Panel on Climate Change (IPCC) as an important tool in the fight against global warming. In 2004, BP began marketing low-sulfur diesel fuel for industrial use. BP intends to create a network of hydrogen fueling stations in the state of California. BP Solar has been a leading producer of solar panels since its purchase of Lucas Energy Systems in 1980 and Solarex (as part of its acquisition of Amoco) in 2000. In 2004, when it had a capacity to produce 90 MW/year of panels, BP Solar had a 20 percent world market share in photovoltaic panels. It has over 30 years’ experience operating in over 160 countries with manufacturing facilities in the U.S., Spain, India, and Australia, and has more than 2,000 employees worldwide. By the end of 2007, BP had the potential total generating capacity of some 15,000 MW of wind power in the U.S. In 1991, based on EPA toxic release data, BP was cited as the most polluting company in the United States. Since branding itself an environmentally sound corporation in 1997, BP has been fined $1.7 million for burning polluted gases at its Ohio refinery, and paid a $10 million fine to the U.S. Environmental Protection Agency EPA in July 2000 and agreed to reduce air pollution coming from its U.S. refineries by tens of thousands of tons. According to PIRG (Public Interest Research Groups) research, between January 1997 and March 1998, BP was responsible for 104 oil spills. BP patented the Dracone Barge, a flexible device that carries liquids across bodies of water, to aid in oil spill clean-ups across the world. On March 23, 2005, an explosion occurred at BP's Texas City Refinery in Texas City, Texas, the third-largest refinery in the United States and one of the largest in the world, processing 433,000 barrels (68,800 m³) of crude oil per day and accounting for 3 percent of the U.S. gasoline supply. Over 100 were injured, and 15 were killed, including employees of the Fluor Corporation. BP has since acknowledged that its mismanagement contributed to the accident. Level indicators failed, leading to overfilling of a heater, and light hydrocarbons spread throughout the area. An unidentified ignition source set off the explosion. The Deepwater Horizon drilling rig explosion refers to the April 20, 2010 explosion and subsequent fire on the Deepwater Horizon semi-submersible Mobile Offshore Drilling Unit (MODU), which was owned and operated by Transocean and drilling for BP in the Macondo Prospect oil field about 40 miles (60 km) southeast of the Louisiana coast. The explosion killed 11 workers and injured 16 others. The explosion caused the Deepwater Horizon to burn and sink, resulting in a massive offshore oil spill in the Gulf of Mexico. The Deepwater Horizon oil spill, the largest accidental release of oil into marine waters in history, resulted in severe environmental, health, and economic consequences, and serious legal and public relations repercussions for BP. In March 2006, a leak in one of BP's pipelines on Alaska's North Slope caused a spill of over one million liters of oil onto the tundra, leading BP to commit to replace over 16 miles (26 km) of federally regulated Oil Transit Lines (OTLs). The leak was the result of corrosion caused by sediment which had collected in the bottom of the pipe and protected corrosive bacteria from the chemicals sent through the pipeline to fight it. As of the end of 2007, one half of the pipeline had been replaced and all 16 miles (26 km) of pipeline are now tested regularly. On July 19, 2006, BP announced the closure of the last 12 out of 57 oil wells in Alaska, mostly in Prudhoe Bay, that had been leaking an insulating agent, called an arctic pack, consisting of crude oil and diesel fuel, between the wells and ice. In July 2006, a group of Colombian farmers won a settlement from BP after the British oil and gas company was accused of benefiting from a regime of terror carried out by Colombian government paramilitaries to protect a 450-mile (720 km) pipeline. BP "Helios" fueling station in Los Angeles. On February 11, 2007, BP announced that it would spend $8 billion over ten years to research alternative methods of fuel, including natural gas, hydrogen, solar, and wind. A $500 million grant to the University of California, Berkeley, Lawrence Berkeley National Laboratory, and the University of Illinois at Urbana-Champaign, to create an "Energy Biosciences Institute" has recently come under attack, over concerns about the global impacts of the research and privatization of public universities. BP has been criticized for its involvement with the Baku-Tbilisi-Ceyhan pipeline, associated with human rights abuses, environmental and safety concerns. According to the Center for Responsive Politics, from 1990 to 2001, BP contributed more than US$5 million to political campaigns in the United States (72 percent to Republican and 28 percent to Democratic candidates), making it the United States' 100th largest donor to political campaigns. BP has lobbied to gain exemptions from U.S. corporate law reforms. In February 2002, BP announced that it would no longer make political contributions from corporate funds anywhere in the world. BP gasoline station in Zanesville, Ohio using previous BP prototype. "ampm" is a convenience store chain with branches located in several U.S. states including Arizona, California, Nevada, Oregon, Washington, Illinois, Indiana, Georgia, and Florida, and in several countries worldwide such as Japan. In the western U.S., the stores are usually attached to an ARCO gas station; elsewhere, the stores are attached to BP gas stations. BP Connect stations in the U.S. are transitioning to the ampm brand. ARCO is BP's retail brand on the US West Coast in the seven states of California, Oregon, Washington, Nevada, Idaho, Arizona, and Utah. BP acquired ARCO (formerly the AtlanticRichfield Company) in 1998. ARCO is a popular "cash only" retailer, selling products refined from Alaska North Slope crude at plants at Cherry Point (WA), Los Angeles (CA), and at other contract locations on the West Coast. BP Travel Centers are large-scale destination sites located in Australia which on top of offering the same features of a BP Connect site with fuel and a Wild Bean Cafe, also feature major food-retail tenants such as McDonald's, KFC, Nando's, and recently Krispy Kreme Doughnuts, with a large seating capacity foodcourt. There are also facilities for long-haul truck drivers including lounge, showers and washing machines all in the same building. BP Connect is BP's flagship retail brand name. 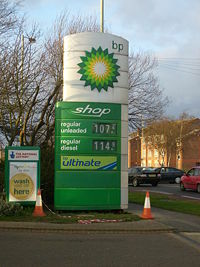 BP Connect Service stations operate around the UK, Europe, U.S., Australia, New Zealand, Federation of Bosnia and Herzegovina and other parts of the world. BP Connect sites feature the Wild Bean Cafe which offers café-style coffee made by the staff and a selection of hot food as well as freshly baked muffins and sandwiches. The food offered in Wild Bean Cafe varies at each site. BP Connect sites usually offer table-and-chair seating and often an Internet kiosk. In the U.S., the BP Connect concept is gradually being transitioned to the ampm brand and concept. BP Express was the flagship BP brand prior to the introduction of BP Connect in 2000. There are still some BP Express sites operating around the world but most have been either upgraded to Connect or changed to an alternative brand. BP Express offers a bakery service but doesn't have the selection of food offered in the Wild Bean Café. BP Shop is commonly used on smaller, mainly independently-owned sites. Products vary in each BP Shop but are usually a selection of convenience store food and automotive products. BP 2go is a franchise brand used for independently operated sites, mainly in towns and outer suburbs, in New Zealand and is currently being rolled out throughout Australia (Not all BP 2go stores are franchises in Australia). BP 2go offers similar bakery food to BP Connect but in a pre-packaged form. Air BP is the aviation fuel arm, BP Marine the marine fuels and lubricants arm and BP Shipping is the shipping arm within the BP group. ↑ ZenoBank, Company Profile for BP PLC (BP). Retrieved October 10, 2008. ↑ 2.0 2.1 Australian Dictionary of Biography, William Knox D’Arcy. Retrieved December 5, 2008. ↑ BP.com, First Oil. Retrieved December 5, 2008. ↑ 4.0 4.1 BP.com, Post War. Retrieved December 5, 2008. ↑ Yousof Mazandi, United Press, and Edwin Muller, Government by Assassination (Reader's Digest September 1951). ↑ The Sell Out of America, John Foster Dulles & Operation Ajax. Retrieved January 7, 2009. ↑ Kennett Love, Royalists Oust Mossadegh; Army Seizes Helm, New York Times (August 19, 1953). Retrieved December 5, 2008. ↑ Kinzer, All the Shah's Men (2003), 195-6. ↑ Anchorage Chamber of Commerce, Natural Gas and Alaska's Future: The Facts. Retrieved December 5, 2008. ↑ www.sea-us.org, BP dossier. Retrieved December 5, 2008. ↑ 11.0 11.1 11.2 11.3 BP.com, New Millenium. Retrieved December 5, 2008. ↑ Robert W. Poole, Jr., Privitization, The Library of Economics and Liberty. Retrieved December 5, 2008. ↑ Steve Lohr, Kuwait has 10% of BP, New York Times (November 19, 1987). Retrieved December 5, 2008. ↑ New York Times, Britain drops a barrier to BP bid. Retrieved December 5, 2008. ↑ BBC News, BP and Amoco in oil mega-merger. Retrieved December 5, 2008. ↑ David Brierly, BP strikes it rich in America, The Independent (London) (April 4, 1999). Retrieved December 5, 2008. ↑ Weekly Corporate Growth Report, BP Amoco to buy Burmah Castrol. Retrieved December 5, 2008. ↑ BBC News, BP sells chemical unit for £5bn (October 7, 2005). Retrieved December 5, 2008. ↑ Guy Chazan and Gregory White, "BP Set to Leave Russia Gas Project," Wall Street Journal 2007-06-22: A3. ↑ BP.com, Vietname Takes the Stage. Retrieved December 5, 2008. ↑ 21.0 21.1 Darcy Frey, How Green Is BP? New York Times (December 8, 2002). Retrieved December 5, 2008. ↑ Sourcewatch, Global Climate Coalition. Retrieved December 5, 2008. ↑ Robin McKie, Seabed supplies a cure for global warming crisis, The Observer (April 24, 2005). Retrieved December 5, 2008. ↑ Carbon-info.org, Miller field part on new carbon sequestration project (May 29, 2006). Retrieved December 5, 2008. ↑ BP.com, Did You Know? Retrieved December 6, 2008. ↑ Sharon Beder, bp: Beyond Petroleum, Battling Big Business: Countering greenwash, infiltration, and other forms of corporate bullying, edited by Eveline Lubbers (Devon, UK: Green Books, 2002), 26-32. Retrieved December 5, 2008. ↑ Save the Artic, SaveTheArctic.com BP Amoco's Green Logo Hides Dirty Record Of Pollution. Retrieved December 5, 2008. ↑ Universal Rope, "Dracone Barges Helping to Clean Up the Environment" (September 23, 2008). Retrieved December 6, 2008. ↑ BBC News, Errors led to BP refinery blast (May 17, 2005). Retrieved December 5, 2008. ↑ John Roach, Alaska Oil Spill Fuels Concerns Over Arctic Wildlife, Future Drilling, National Geographic News. Retrieved December 5, 2008. ↑ Commondreams.org, Oil Gushes into Arctic Ocean from BP Pipeline. Retrieved December 5, 2008. ↑ Mark Tran, BP shuts leaking Alaskan wells, Guardian Unlimited (July 19, 2007). Retrieved December 5, 2008. ↑ Independent, BP pays out millions to Colombian farmers. Retrieved December 6, 2008. ↑ Energy Biosciences Institute, Home Page. Retrieved December 5, 2008. ↑ Berkeley, Stop BP. Retrieved December 6, 2008. ↑ CCCBM, Citizens concerned about project. Retrieved December 6, 2008. ↑ GNN, The Baku Ceyhan Pipeline: BP's Time Bomb. Retrieved December 6, 2008. ↑ The Center For Responsive Politics, BP. Retrieved December 5, 2008. ↑ Terry Macalister and Michael White, BP stops paying political parties, Guardian. Retrieved December 5, 2008. Ferrier, R.W., and J. H. Bamberg. The History of the British Petroleum Company. Cambridge: Cambridge University Press, 1982. ISBN 0521246474. Meyer, Karl E., and Shareen Brysac. Kingmakers: The Invention of the Modern Middle East. W.W. Norton, 2008. ISBN 978-0-393-06199-4. United States. BP Pipeline Failure: Hearing Before the Committee on Energy and Natural Resources, United States Senate, One Hundred Ninth Congress, Second Session, to Receive Testimony Relating to the Effects of the BP Pipeline Failure in the Prudhoe Bay Oil Field on U.S. Oil Supply and to Examine What Steps may be Taken to Prevent a Recurrence of such an Event, September 12, 2006. Washington: U.S. G.P.O., 2007. ISBN 9780160780684. This page was last modified on 9 December 2016, at 00:01.